Full Members are not used to being in this position - having to go through qualifying to play a world tournament in a game only a handful of nations play at the highest level. But that is the way it is this time, and as Brendan Taylor said, it is a "tricky" situation for Zimbabwe to be in. As the only Full Member in their qualifying group, it would be rather embarrassing if they don't go through to the main round. As a side that has not played any international cricket since September, and endured a stop-start domestic season amid the familiar monetary crisis back home, avoiding that embarrassment isn't going to be straightforward. And lining up against them in their first match is Ireland, arguably the best side the Associate world has thrown up. Taylor admitted Zimbabwe could not afford any rustiness or complacency. "There is a lot of expectation from the people. We are expected to go through and we believe we are good enough to do that," Taylor said. "But having said that, Ireland is a good team, Netherlands have got some good players and so have UAE and we have to play our best cricket to do that. "We have never been in a situation like this. It is very tricky for us. We realise we are going to have to play tough cricket. They [Ireland and Afghanistan] are improving all the time. They have got some really hungry players, some match-winners. They are really setting the bar for Associate teams. And they are really closing in the gap between the Test nations, which is good and healthy for cricket. It is crunch time now, so the better team on the day is going to come through. "We are coming up against opposition we are not familiar with. That can be tricky. Each team will have a match-winner. We need to respect and give credit to the other teams. We need to try and play dominating cricket as you can be ball-watching if you don't respect other teams." 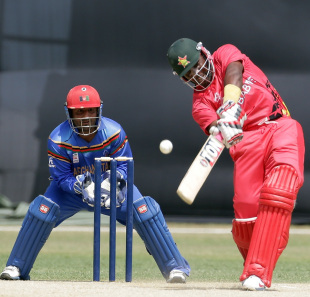 Taylor and Zimbabwe will be wiser after the shocking loss in the warm-up match to Hong Kong, though the captain felt the result, as bad as it was, would not have much bearing on his side's campaign. "No, not really. We don't have any day-night games I think. The toss was crucial against Hong Kong. We struggled against them, probably the poorest performance we have had in a number of years. They have got some match-winners and they came over and got them over the line. It is great to see that world cricket is getting stronger. "We probably needed that kick up the back side. We came out and played the way we know we can against Afghanistan, who are proving quite a decent side at the moment. Hopefully we can carry some sort of momentum into the next match." While their preparations have been minimal in terms of match practice, Taylor said the Zimbabwe players knew Bangladesh conditions quite well, having toured the country numerous times and also turned out in tournaments such as the Bangladesh Premier League. Also, for all their struggles, Zimbabwe have a wealth of limited-overs experience in the squad, and Taylor said his players would have to make that count. "We are an extremely threatening team if we click. Unfortunately we have not played as much cricket as we would have liked to. We have trained very hard as individuals and as a team. We are experienced players. Some of us have played over a 100-150 one-dayers. There is no excuse, the players need to step up. We have been around for a number of years so hopefully we can keep improving and be a force to reckon with."